Cali besties Heather Morris and Tamie Smith of Next Level Eventing were undeniable, and indomitable, in the two- and three-star divisions here at Rebecca Farm today. Ooh oh … etc. The two are used to cheering for one another, even when they’re in the same division. Heather Morris and Charlie Tango. Photo by Leslie Wylie. Both are winning today. 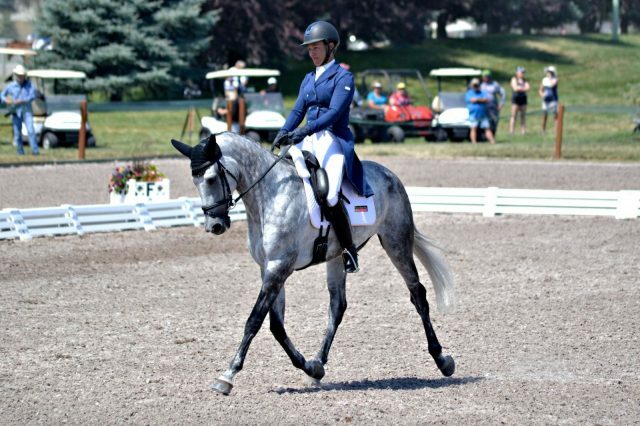 Heather staked out the top of the CCI3* dressage leaderboard on Charlie Tango, a 9-year-old Irish Sport Horse gelding owned by Team Express Group, with whom she won the CCI2* here two years ago. Warming up for their test, Heather says she felt like the wheels were coming off. “I got all flustered and I went into the ring flustered and I thought it was awful, and then Tamie was like ‘It was good’ and I was like ‘No it was awful,'” she says. Their score of 46.1 indicates it was not, in fact, awful. Of Ian Stark’s cross country course, Heather says that there’s a lot to do out there. The pair finished second at their last CIC3* outing at Galway Downs earlier this year, and we look forward to watching them get the job done tomorrow. 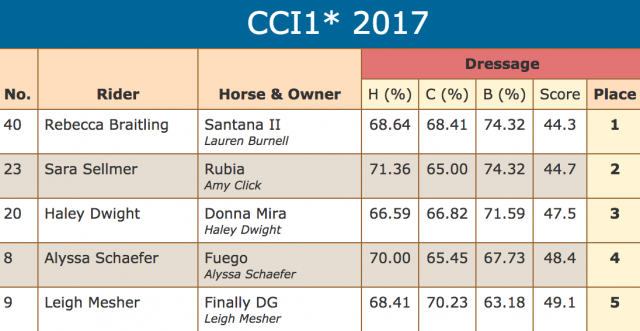 Meanwhile, Tamie sits atop the CIC3* dressage throne with Fleeceworks Royal, an 8-year-old Holsteiner mare owned by Judy McSwain. The pair scored a 42.6, and unlike Heather, Tamie knew immediately that it was a good test, dropping the reins and giving “Rory” a big hug after their final salute. 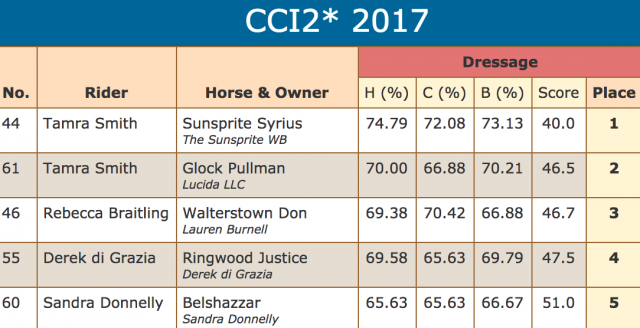 Tamie is also fifth in the 14-horse CIC3* division on Wishbone, and has the top two spots in the CCI2* with Sunsprite Syrius and Glock Pullman respectively. Both Heather and Tamie have been big supporters of The Event at Rebecca Farm from the get-go, making the solid 24-hour trek from Temecula, California, to Kalispell each year to contest the event, usually with a big crew in tow. Cross country day at Galway Downs was Next Level (see what I did there?) as the upper levels tackled Ian Stark’s challenge to decide the winners of the FEI divisions. Frankie Thieriot Stutes successfully completed a wire to wire win in the CIC3* aboard Chatwin, securing their first win at the Advanced level. Looking to the CIC2*, Tamie Smith and Sunsprite Syrius also clinched a wire to wire win on their dressage score of 47.2. Syrius, who is nine this year, is stepping up to the two-star level this weekend, so a win on the first outing is a big check mark for this talented horse owned by Sunsprite Warmbloods. Tamie also took home the win in the CIC1*, where we’d like to issue a big welcome back to the Ahearn family’s Mai Baum, making his first start since his win at Fair Hill International in 2015. “Lexus” scored a 32.3 in the dressage to take a handy lead and added one rail to his score before going on to an easy breezy double clear cross country round. Look for more on the return of the Black Stallion here on EN to come later! The Horse Trial divisions will finish competition tomorrow, so there’s still more to come from Galway Downs. I will also be updating this post with current photos. Go eventing! Fleeceworks Royal and Tamra Smith tackle the CCI2* course. Photo by Libby Law. Fleeceworks Royal, recipient of the Holekamp/Turner Young Event Horse Le Lion d’Angers Grant, made her way around the cross-country course in flying fashion, adding nothing to her dressage score of 51.3. Piloted by Tamie Smith, “Rory” had a peak performance around this challenging track at the FEI World Eventing Breeding Championship, jumping from 30th to 16th place in the 7-year-old division. Judith McSwain’s Holstiner mare earned these funds to travel to Le Lion d’Angers after being the highest-placed 2014 Young Event Horse (YEH) graduate who qualified for this Championship as a 7-year-old. The grant, backed by Dr. Tim and Cheryl Holekamp and Christine Turner, aims to encourage U.S.-based breeding and training of young horses. Rory was bred in California by Charlotte Wrather. She is by the Holsteiner Riverman, and out of Marisol. The other U.S. representative and fellow YEH graduate, Betawave, picked up only .4 time penalties to move into 31st place in this very competitive 7-year-old class. Owned by her breeder, Carol Singh, and her rider, Robyn Fisher, “Leta” is a Holstiener mare by Linaro and out of Wavelength. Marion Drache and Ingrid Klimke’s Weisse Duene kept the lead of the 7-year-old championship division. The Holstiener mare (Clarimo x Espirit V), ridden by Klimke, jumped to a double clear cross-country finish to continue to sit on 36.9 penalty points going into tomorrow’s show jumping. Pippa Funnel piloted Billy Walk On (Billy Mexico x Shannon Line), owned by Barbara and Nicholas Walkinshaw, to a faultless run. They sit in second place on 39 points. Double clear rounds also helped Vroum D’auzay & Miaxime Livio, Chillis Gem & Gemma Tattersal, and Vegas des Boursons, also ridden by Livio, to move into third, fourth and fifth places respectively. Though the cross-country was influential, the course seemed to reward forward, accurate riding. 19 pairs came home clean within the time, and only six of the 59 starters did not finish. BOOM . . . Today I start with an ending. They did it and did it RIGHT. Rory and Tamie finished double clear! More of that later. I woke early today after a restless sleep. We are all a bit nervous, the stakes are high. Each of us dressed in our carefully selected red, white and blue clothing combinations. We wanted to make sure there was no doubt who we were rooting for and where we were from. We stepped out the door, walked down the street, wow. The sleepy little town had exploded. The bridge was blocked off. People, young children baby strollers and dogs were everywhere. The event was expecting 45,000 spectators. The excitement started. Tamie and Rory were scheduled to go out of the box at 1:00 p.m. The 6-year-olds started at 11:00 a.m. We had some time, the obvious default was the trade fair. I now own a beautiful short cropped oilskin coat and a brown felt hat, an absolute must for every southern California resident. We headed up to wish Tamie and Rory “bonne chance” (good luck in French). Rory was calmly eating her hay. She came over to greet us and asked politely where her apples and carrots were. We gave Shannon the bag for later, grabbed our flags on a stick and headed out to cross-country. The design of the facility and course has one or two places where you can see multiple fences. The best way to view is walk gradually around the course. Walking the course was like a being on a slow conveyor belt that slowly flowed around the course, it stopped as a horse approached the jump you were nearing and restarted as the horse galloped away. It was 5 to 20 people wide. You could leave the group at any jump you wanted to watch for a period of time and rejoin when you wanted to move on. It just kept flowing. It was all very civilized everyone kept moving in one direction. We saw a variety of sights as we slowly went with the flow, four old men standing by the jumps drinking their wine, friendly sweet donkeys carrying baskets for recyclables. It was wonderful to have the distraction, which kept my mind off the elephant in the room, the 7-year-old cross-country. We saw 6-year-olds in every size shape and color from France, UK, Ireland, Germany, Spain, Sweden, Holland, Belgium, Italy and China. Some rides were smooth and seemed effortless, others seemed a work in progress. We saw the CCI2* jumps and, the butterflies started. The water complex and combinations, as always had large groups of people, yet I was still amazed at the size of the crowds in all directions. It was overwhelming. It hit me, “what will Rory think?” The excitement grew and nervousness edged in. We walked back to the start. Along the way we were warmly greeted by some of the individuals we met on dressage day. They wished us the best of luck. We met French spectators who were not horse people and who spoke limited English. We spoke limited French yet we had a conversation about Rory and they wished us luck as well. It was time. I saw the beautiful grey and white tail flying over the warm-up fences. Rory was jumping out of her skin. Clearly Tamie and Rory were ready, so I was as well. We headed off to the start box, flags in hand. My friends, Lynette and Barb were cheering, waving flags making noise for 10. GO USA. I was ready with my camera and BOOM . . . they were out of the box. We saw the first fences and planned to view the jumbotron. Well it was not quite as planned. We hear, “Tamie Smith and Fleeceworks Royal” followed by French phases and wondered what was said. It was a long four minutes in the dark and then, they popped out of the trees, dropped off the bank and jumped the b and c element on a soft rein. Go Rory. Go Tamie. They headed to the spider, then to the chess board and finally to the last fence. On the jumbotron, I suddenly noticed the count down in the corner. It looked like great time. It looked like they were going to go double clear. I was jumping up and down. They crossed the finish with seconds to spare. THEY DID IT! I am not really sure how to share the feelings. I was consumed with feelings of joy, relief, excitement and happiness. Tamie Smith and Fleeceworks Royal, representing the USA, were third go in The 7-year-old FEI World Breeding Eventing Championships. They threw down the gauntlet and finished DOUBLE CLEAN. GO USA!!! Fleeceworks Royal and Tamra Smith in the Show Jumping at Le Lion d'Angers. Photo by Libby Law. As Fleeceworks Royal cleared the final fence in show jumping today, she made her mark as an American bred and produced horse who held her own in the most elite age-based competition in the world. Judith McSwain’s “Rory” is a Holsteiner mare (Riverman x Marisol) competing against the best of the best at the FEI World Breeding Eventing Championships in the 7-year-old CCI2* class. Rory is the 2016 recipient of the Holekamp/Turner Young Event Horse Le Lion d’Angers Grant, which she received for being the highest placed 2014 USEA Young Event Horse (YEH) graduate who qualified for this championship as a 7-year-old. Only in its second year, the grant now has helped two American produced horses complete the CCI2* at Le Lion d’Angers. Backed by Dr. Tim and Cheryl Holekamp and Christine Turner, it was created to encourage the domestic breeding and production of high caliber young horses, and this goal was reached in its entirety this year as it sent Rory, the first American bred young horse, to the championship. California-bred Rory held her own against the stiff competition this weekend. Piloted by Tamie Smith, Rory earend a respectable 51.3 in dressage before jumping boldly around the tricky cross-country, coming home penalty free within the time. 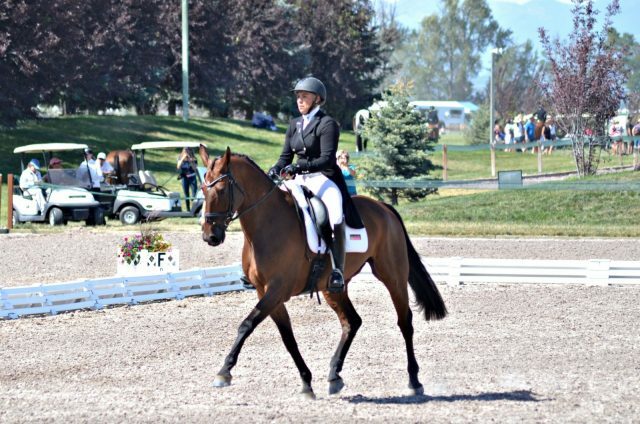 With a bit of a footing change from the warm up to the competition ring, she added 13 penalties to her dressage score, ending the weekend in 24th place out of the 59 starters. "She felt super today and was jumping out of her skin in the warm up. She got in the ring and the ground was very mushy, nothing to push off of. It felt very bizarre for me, so I can imagine what she was thinking," Smith said of Rory in the show jumping. "Last night she acted as though she wanted to go again and was very keen this morning for the trot up. I was really pleased with her fitness and overall performance, I of course would have loved a different outcome, but that's eventing. Typically I could say I should have done this or that, and honestly I just think she was green on the footing. She's a better horse for the experience she has had and I am so proud of her." "To be able to bring over a 7-year-old and compete at the World Championships is very influential to their careers. You know what kind of horse you have after galloping around the track here at Le Lion. The crowds, the course, the atmosphere, it's really a good test to know what kind of horse you really have. I know I have a great one in Rory and I'm so happy to have shared the experience with her owner and long time friend Judith McSwain and her and now my friends Lynette Bowman and Barbara." "Rory will go back to Judith's for the winter break and let down and be able to eat grass and then we will see what is on the table for next year. She feels like an Advanced horse after this weekend and that is what you want after a big competition like this. She's a lovely mare and I'm just lucky to be her person," Smith continued. Rory wasn’t the only YEH graduate competing at Le Lion this weekend, she was joined by Betawave (Linaro x Wavelength). Owned by her breeder Carol Singh and rider Robyn Fisher, “Leta” ended the weekend in 32nd place. The Holsteiner mare started the weekend on a score of 62.5 after dressage, and made an impressive leap from 58th to 31st place after jumping clear on cross-country with only .4 time penalties. In the show jumping today, Leta had four rails down, but shifted on the leaderboard only slightly to end in 32nd place out of the 51 finishers. Weisse Duene clinched a wire-to-wire win this weekend with Ingrid Klimke in the irons. Klimke and Marion Drache’s Holstiener mare (Clarimo x Espirit V) completed this CCI2* championship nearly ten points ahead of second place finishers after having two fault free jumping runs. Rails were plentiful in this two-star class, and had a significant impact on the final leaderboard. Despite two rails by Barbara and Nicholas Walkinshaw’s Billy Walk On, he remained in second place on a final score of 47. All other top ten pairs picked up rails to make way for the tenth-placed trio, Cooley Showtime & Jonelle Price, Vassily de Lassos & Thomas Carlile, and Vinci de la Vigne & Astier Nicholas, to end the weekend in third, fourth and fifth place respectively. The USEA Future and Young Event Horse Series, created only a few years ago, aim to encourage domestic breeding. The goal of the program is to create a streamlined pathway from American breeding to American training and eventually representing the United States on an international stage. To have two American bred horses finish strong at a competition of this magnitude reflects the growth of these programs as well as American breeding. Find all 7-year-old scores here. Rory and her support crew after dressage. Photo by Libby Law. This is my first trip to Europe and it has been full of new experiences. One of my favorite experiences so far is the ability to walk to so many places. You ask Europeans how far something is and the consistent response is 20 minutes. We have learned 20 minutes can range from 10 to 45. The farmhouse we booked is a 10-minute walk from the grounds. However, I was ready for the 20-minute European walk. I walked to the end of our quaint street. I looked, and saw the gorgeous cross-country fences. We really were only 10 minutes away… little did I know, it was 10 minutes from the edge of the property. The Hippodrome du Lion d’Angers is a gigantic property. Shannon [McCormick, Rory’s groom] had told me it was a 30-minute walk. I thought to myself “she left in the dark and surely must be mistaken.” I headed off at a brisk pace for Wednesday’s jog, as I passed the first closed gate, the 20-minute rule came to mind. The scenery was amazing, lots of old cottages, a new equestrian facility and finally a beautiful stone gated entrance, leading to a very long tree line road. Walking down the path, I saw lush green grass, paddocks and gradually cross-country fences, which are works of art. I was amazed at the creativity, workmanship and challenging appearance. The path ended at a beautiful stabling area with concrete barns and a very creative jogging lane. One of many beautiful cross-country fences. Photo courtesy of Judith McSwain. The setting was amazing for the first horse inspection. I watched as the most promising 7-year-old horse and riders, presented and jogged elegantly in front of me. Tamie and Rory moved in to line and then I heard it, “Fleeceworks Royal and Tamara Smith USA”. My heart skipped a beat. I swallowed hard, holy cow. Here we are, the dream came true. Tamie was smarty turned out in a dress that complemented her dapple grey partner. Rory raised her head, calmly looked around and seemed to say, “these must be all my fans.” They passed the jog with flying colors. We heard the magic word, "accepted." Yesterday was started off at the same wonderful pace. Staying so close to the Hippodrome has let us start each day at a civilized hour. The closest gate is now open so we are really only 10 minute walk from the center of the competition area and the trade fair. The stabling is still a bit further. As we were walking and talking about the awe of our surroundings, a wonderful lady heard our accents and said, “you have come a long way,” as she chatted with us about our journey and our experiences. She was so gracious and made us feel so welcome. She was the mother of the British competitor, Kitty King, and although we did not know it, it was to be one of many such delightful encounters through our day. We arrived in the barn area as Tamie, Rory and Shannon were getting ready. Tamie had taken Rory out for a canter that morning and told us she felt great. We quickly put on our special jackets made to complement our USEA/USA ball caps. The front said Holekamp/Turner Grant. The back said USA Le Lion d’Angers 2016 7 YR Old World Championships. We were ready! Tamie and Rory were early in the order of go, having drawn the third position. The riders are provided two warm-up areas. The first a grass court in the trees. The next is adjacent to the in-gate. It is gorgeous with emerald green grass and a back drop of the village of Le Lion with its 300-year-old cathedral. Tamie and Rory’s warm-up was wonderful. Suddenly it was time. We heard overhead, “Tamara Smith and Fleeceworks Royal USA.” Our USA bred girl went up the center line and landed a square halt. A visual of the up and downs of three and a half years went through my mind. I just smiled. It had all been worth this moment. Tamie and Rory looked amazing. Their test was beautiful, flowing and balanced. I could not have been more proud. Rory and Tamie earning a 51.3 in dressage. Libby Law Photo. Rory and Tamie’ s cheering section were waiting at the exit gate, where big hugs and smiles abounded. The incredible photographer, Libby Law was there and captured our moment in time. Rory, graciously accepted the accolades and praise from her most ardent fans. We walked back to the barn. Rory let us give her big hugs. We told her how amazing she was, to which she looked at us as if to say “of course.” We promptly head to the trade fair afterwards. The trade fair was very large with over 100 assorted vendors from horse trailers to scarves. My friends and I made the first pass today. The vendors were wonderful and helpful us communicate. We were quite overwhelmed and vowed to return later. The next stop was back to the dressage arena to cheer on Robyn Fisher and Betawave the second U.S. competitor who made the trip across the pond. It is wonderful to have another U.S.-bred horse and her group here. While we were watching dressage, different individuals from various nations came up, commented on our jackets, welcomed us warmly. There were always a few wonderful moments sharing the international bond that unites us, horses. We have felt that people on the grounds and in the town of Le Lion to have been incredibly friendly and genuinely helpful. Photo courtesy of Judith McSwain. The next adventure was walking the most incredible and beautiful cross-country course with Tamie. It is always so interesting to learn about the course through the eyes of an experienced rider. We were able to walk up to the fences, see heights, widths, drops and angles. It looks like a challenging course. Each fence is really a piece of art with incredible details. We, the cheering section, were planning our spectating strategy as we walked. The question, as always, is how to maximize the number of fences to see. I am excited to see how each fence will ride and what Rory will think of the course. Judith and Tamie checking out the drop. Photo courtesy of Judith McSwain. We left Tamie and headed back for the farm house. The trade fair just happened to be in the way. We were forced to make initial purchases with some thoughts lingering on the candy apple red or French blue breeches. Dinner ended up a minor adventure. We decided to try a restaurant recommended to us by Janet Murphy, Chef d’Equipe of the Irish Team. After the conversation, it appeared to be close by and the directions sounded simple. Well after again taking a driving tour of the surrounding French countryside in the dark without finding the restaurant, we instead found a place within walking distance. They had crepes, not just crepes, but amazing crepes, so we have crossed another item off our bucket list…eating crepes in France. Rory does not compete today. It looks like she will have a jump school. We may go into town or stay local and explore. I close the blog out with anticipation of cross-country day tomorrow, the excitement we all feel. When the first horse leaves the box; when we hear the overhead announcement, with the number, the rider, the horse name and country, when we see these amazing teams in action. I wish everyone the best. I wish Tamie and Rory an extra spot of good luck, and to know I will be mentally riding every fence with them and running between others. Lastly, I will try prepare myself to be ready to hear those words from overhead, “and now out of the box representing the USA Tamara Smith and Fleeceworks Royal.” I do not think I will have dry eyes no matter how I try. Go Holekamp/Turner Grant, Go Fleeceworks Royal, Go U.S. bred and MOST of ALL GO USA!